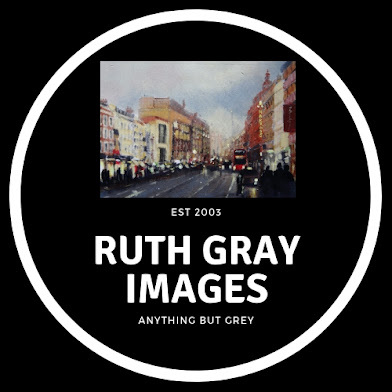 Ruth Gray Images: How I use Reference Material in my Art. How I use Reference Material in my Art. Im always asked how do I paint am I sat outside or do I work from a photograph but I think its more complicated than that. To create my artwork it is a combination of many things, being a landscape artist involves a lot of watching of the seasons seeing the changes that the weather brings. I'm always interested in how the sky effects the colours seen on the land how the position of the sun determines the length of the shadows and the overall atmosphere of the image. I do believe being out in the landscape will improve my work and this month sees the start of an intense month of field work. 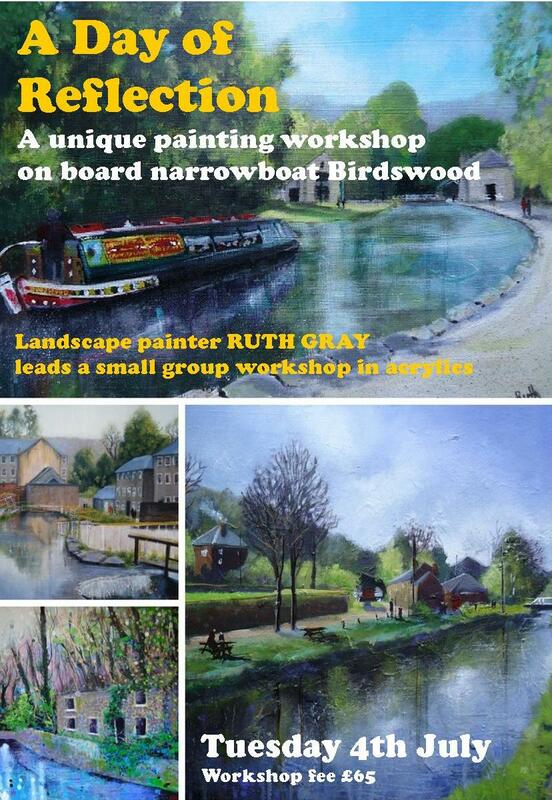 I have been lucky to be asked to lead a couple of extremely interesting workshops the first is with Fleet Arts and Derwent Wise taking an art group to the National Stone Centre as part of their Anatomy of the Landscape Project, to work on describing the geology of the landscape of the lower Derwent Valley, by drawing and painting. 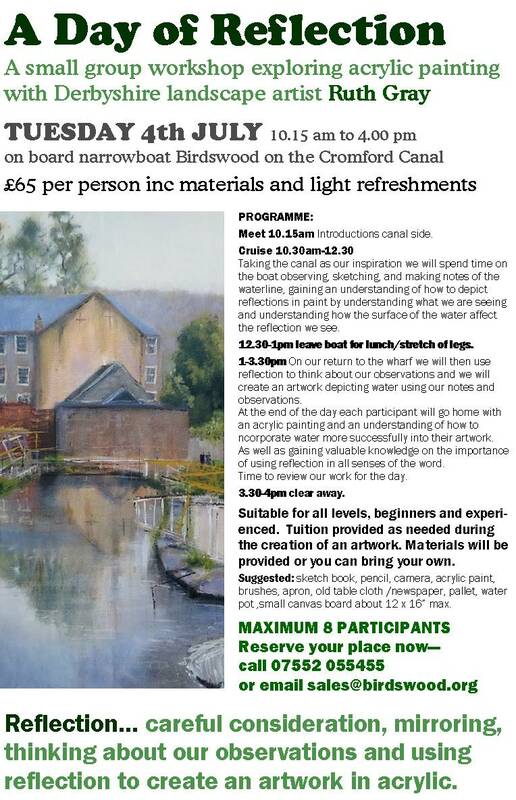 The second is a Day of Reflection a workshop on Birdswood the canal boat on Cromford Canal July 4th, there are only 8 spaces available, on this workshop I will be encouraging artists to look at reflections and learn how to describe them as we cruise the canal, and after lunch also use reflection to improve their painting by being able to look back at what we have seen and think about how to use the imagery collected to create a painting. This will certainly be a very relaxing day. Please email sales@birdswood.org or call 07552 055455 to book. 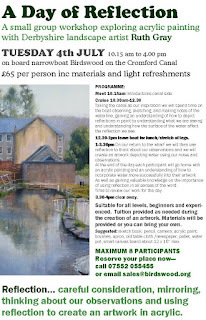 Purple and Grey have also organised two plein air trips for June one is Monsal head June 14th and the other is Trent Lock June 28th both are free and start in the car parks at 10.30 am for a day of non directed painting, drawing and photographing and of course socialising. All this being in the landscape will help inspire new work and I may or may not use the sketches and photographs. Much of my work is based on memory especially my ink paintings which are purely from memory and use colour to describe a fleeting feeling. Obviously my street scenes are much more based on representation but even those I change and if you place the photograph next to any of my paintings you will see the divergence. 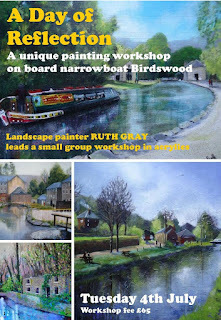 Below is a photograph I took a couple of years ago of Bakewell the first painting I did I added figures and made it a night scene and the second one that I painted as a demo piece for an art group I made more of a rainy afternoon. Obviously if you prefer photo realism this will not be for you! 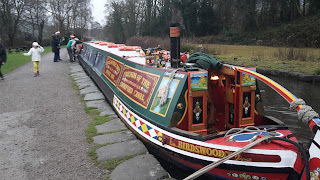 My next show will be at The Great Dome Art Fair Buxton with the Peak District Artisans, on the Saturday I will be doing a demonstration about Aerial Perspective. Visit my website click the logo. Making Handmade Cards With Two Birds!